Paying for college can be daunting, but it’s essential to approach it in the right way. Blindly signing up for maximum loans, or cosigning for your student at a private lender, can land you in a lot of financial trouble. Instead, make sure you know how student loans impact the credit of your student and yourself as a cosigner. Learn how to protect your credit score as you shop. Finally, discover how to help set your student up for success so you can be released from the loans. When you compare loans based on interest rates and terms, you need accurate information. Often, this means getting quotes from multiple banks – which require credit checks. The good news is that if you do this wisely, it doesn’t have to hurt your credit. Start by getting as much information as possible without a credit check. Look for favorable interest rate ranges, good cosigner release terms, and more. 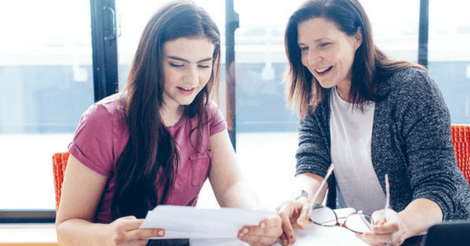 You may be interested in lenders that have a variety of repayment lengths available so you can choose what’s best for your student and your family. It may be important to ensure there are forbearance options in case of financial difficulty, medical conditions or change in employment. You also want to compare the features that make each lender unique. For instance, CommonBond has a social promise that focuses on giving back to children in need with every loan they make. From there, you can create a short list of the lenders you’re most interested in. While most loans require a hard credit pull to give you specific interest rates and terms, the credit bureaus understand the importance of shopping around. As a result, you have a 30-day “shopping window” to find the lender you want. What this means is that multiple hard credit pulls for the same reason that happen within a 30-day time period count as one hit, rather than multiple hits. There are a few details to setting up this timing, but by carefully managing your inquiries you can avoid having your credit score drop too far for multiple hits. This is why it’s important to have a “short list” of favorites first! Most lenders will not approve a high school student for a loan with no cosigner, so it’s a near certainty that your student will need one. Whether that’s you or another trusted friend or relative, there will be an impact on the cosigner’s credit. If you have great credit and are willing to cosign, that’s great. However, you may have credit problems in your past, or you may not feel comfortable committing to a large payment if your student has trouble. In that case, you’ll want to find someone else who can help your child and is comfortable with cosigning. This could be another relative, a close family friend or another person like that. Be very careful about choosing a cosigner. It needs to be someone who trusts and believes in the student, and not someone who is reluctant. Money can bring bad blood into even the closest relationships. Of course you know that cosigning means that if your student cannot pay, you are responsible for the loan. What you may not know is that even if the student is making regular, on-time payments, the debt shows up on your credit report. This can negatively impact your debt-to-income (DTI) ratio and make it hard to get future loans – even education loans for sophomore year and beyond. Be sure you understand the full impact of four years of college, not just the freshman year. And if you have other children coming up who are getting ready for college, keep in mind the debt impact of helping them as well. It may be helpful to have other cosigners help, if possible, with future years so that the debt-to-income hit doesn’t affect anyone too significantly. You can also find a lender that uses something other than DTI alone to evaluate loans. For instance, CommonBond uses an algorithm that examines free cash flow. They understand that DTI doesn’t tell the whole story. Once your child graduates and establishes a regular schedule of paying on time, both their credit and your credit will benefit. Once they build up a bit of their own credit, they may be able to release cosigners or refinance the loan into a single unit to make it easier for everyone. The final step in the student loan process is to encourage your student to build up good credit so that they can refinance the loans or release the cosigners. Financial responsibility starts while your child is still in school. Make sure they avoid credit cards as much as possible and understand that any debt they incur in school will add to the burden after graduation. The next thing to do is to help your student set up a financial budget. Many people, in college or not, tend to spend money as they get it. They don’t think about the long-term impact this has on their ability to pay bills and get rid of debt. Once your child graduates, they can create a budget based on the expenses they have in their first apartment and with their first full-time job. Make sure they know there’s nothing wrong with having roommates even after college! It’s a great way to keep expenses down. Use your wisdom to help them set reasonable expectations for life after school is over. Many students think their first “real” job will give them an amazing income and they’ll finally get to live the spendthrift life they’ve dreamed of. You know that isn’t true – if anything, getting out of school gives you even more responsibility! Make sure they have a good understanding of living modestly. Different lenders have different timeframes and standards for cosigner release. Generally, you should start looking into being removed from a loan after two to three years of regular, on-time payments. As an example of the requirements for releasing a cosigner, CommonBond requires that the student borrower has graduated, is older than 21, has made 24 consecutive, on-time monthly payments of the loan’s principal and interest; and meets CommonBond’s current underwriting criteria which includes a review of the student borrower’s credit. Requirements for releasing a cosigner will vary lender to lender, so it’s important to check this out before committing to a loan. Your child’s income should also increase in the first five years they are out of school. An entry-level job can become mid-level before you know it. As this happens, your child becomes financially capable of handling the loan themselves. Generally a cosigner release will require your child to meet the requirements of getting a loan for that amount in their own name. If there are multiple loans, it may be better to apply for a single student refinance loan instead of several releases. Once you’re released from the loan, the debt is fully your child’s responsibility. It will show up on your credit as “satisfied” and will not count against your DTI anymore. Great work – you did it! Newer PostColleges That Meet 100% of Need – Or Do They?